Well, this week’s lesson was all about sleeves. I decided to use the original screen shot that I took to introduce this class because it really focuses on the sleeve adjustments that Lynda does in this class. You can see that she’s cut into the crosswise grain lines to add fabric to the sleeve as it was needed. In this class Lynda fits all three models we’ve seen previously: Betsy, Dolly, and Rhoda. Between the three of them, we get to see examples of forward rotated shoulders, full upper arms, narrow shoulders, and skinny arms. 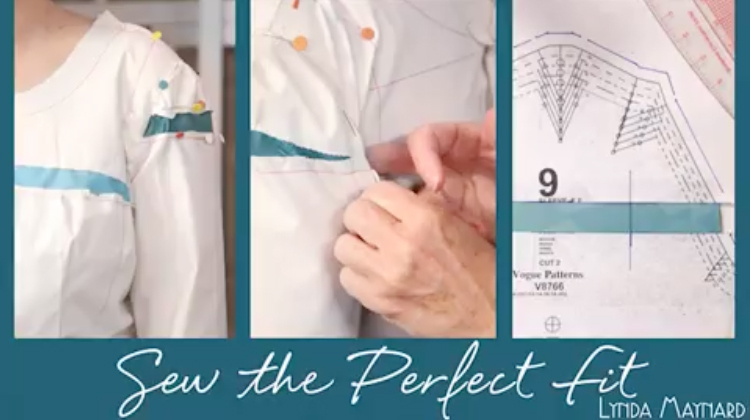 She briefly addresses sleeve circumference and restriction of movement, though it sounds like the latter will be covered in more depth in the next class in which she goes over how to add gussets to the sleeves. I enjoyed getting to see how she prepares the sleeve for fitting and pins it to fit. The method that she presents keeps the sleeve free, which allows her to move it in or rotate it as needed for a better fit. This past weekend I met up again for another Seattle seamsters fitting session. There were six of us there, including our host, Denise of The Smorgasnerd, Jennifer of My Sewing Suite, Missy of Missy’s Craft Journal, Hayley, and Teresa. After a bunch of fun introductions, including a high school reunion of sorts between two of the lovely ladies, we managed to fit the three of them who were ready and willing. Both Missy and Jennifer have already posted about the weekend on their own blogs, so you can head over there and read about this great learning experience from their perspective. It also sounds like Denise has made great progress transferring her muslin adjustments to the pattern paper, which is a huge accomplishment! It was fun getting to talk through a whole bunch of Lynda’s fitting lessons with so many knowledgable and experienced sewers. The only thing of note was that I don’t remember changing a single sleeve on any of the women this past weekend, so this fitting session and the focus of this particular post aren’t really aligned! I wish I had a good tie in to this week’s sleeve lesson, but I guess the important thing is that now five women have gotten a good start on fitting Vogue V8766 on themselves, and seven women have had great fitting lessons thanks to this class. I know of two other women in the Seattle area taking the class, so my hope is that we can have a third fitting session that could include them as well. Let’s keep this fitting thing going as long as we can! After all the fitting was completed, Teresa showed off the sloper she’d made after taking both Kenneth D. King’s moulage class and Lynda’s in-person fitting class at the Sewing and Design School in Tacoma. Teresa also explained how to adapt the Vogue V8766 pattern we’re using for the class to better fit even before the first muslin is cut. What she said made a lot of sense, and I’d love to have that kind of grasp on making and adjusting patterns right from the start. I think it’s time to start saving for some classes! I’ve really enjoyed the online Craftsy classes that I’ve taken from both of them, so I could only imagine how great an in-person class would be. That said, what I’ve learned from these online classes already makes me feel leaps and bounds further in understanding fitting than I ever did before. Next week we’re on to gussets. I can’t wait to dive into her method for how to add a lot of movement to a sleeve. I love the Burda peplum blouse that I made last fall, but the sleeve was so restrictive. I’m actually really embarrassed to have sent that garment to a friend. It was well constructed, and the fabric and pattern were great, but those sleeves… At the time I just figure that was what happened when you made a top out of a fabric without stretch. But, after making the Alma, I now know better!